Lots to like, but not enough to recommend. I’ve always had a soft spot for the QX80, Infiniti’s lovable brute of an SUV. But the more and more I reflect on my time spent driving this Mocha Almond tester, I’m finding it harder and harder to come up with solid reasons why I’d recommend anyone buy it. On its own, in a vacuum, the Infiniti impresses with lots of luxury, huge capability, and unique style. But in the greater context of the fullsize SUV segment, there’s no one thing that sets the QX80 apart from its classmates. 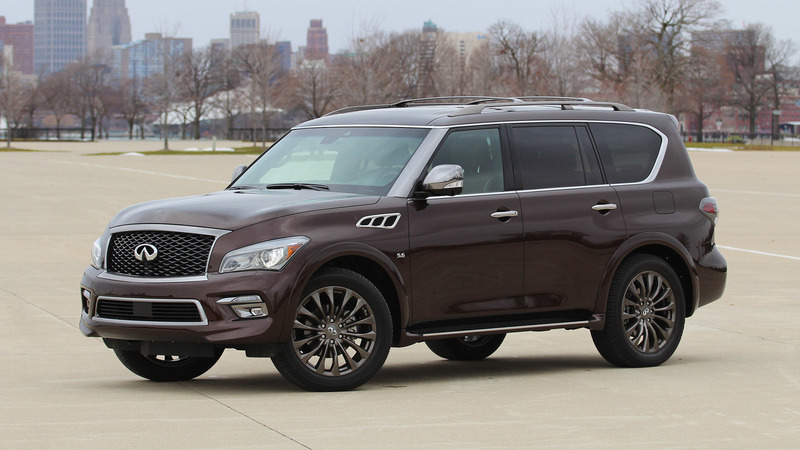 And don’t forget, Nissan sells a version of the QX80 for a lot less money – but not much less luxury – as the Armada. Big power. My favorite thing about this generation QX80 is its engine. I love Infiniti’s huge 5.6-liter V8, with a healthy 400 horsepower and 413 pound-feet of torque. Even at nearly 6,000 pounds, the QX80 has no problem with the get-up-and-go, with a hearty sound coming from underhood and the exhaust out back. 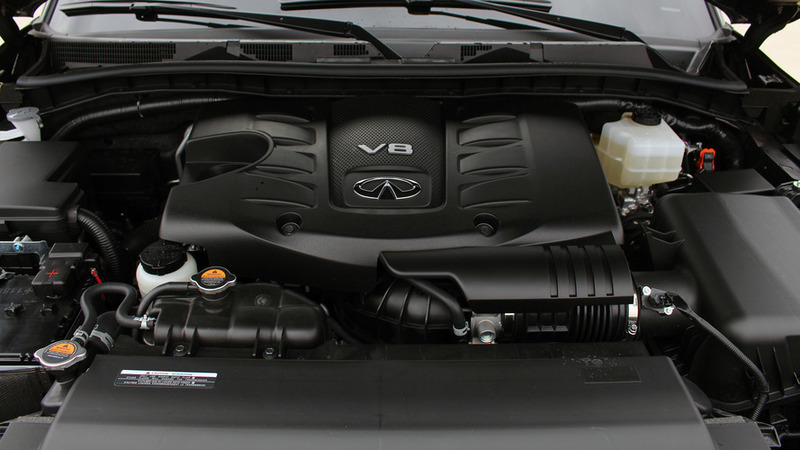 All of the Infiniti’s competitors use V8 power, but none of their engines feel this robust. Plus, Infiniti’s Hydraulic Body Motion control system keeps the QX80 from feeling overly floaty or lumbering around with lots of roll. Big utility. The QX80 is a huge, body-on-frame SUV, and the benefit here is a lot of capability. 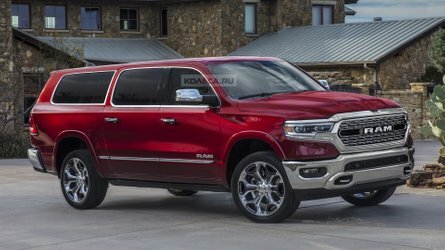 It’ll haul 95 cubic feet of stuff with the rear seats folded, and it’ll tow 8,500 pounds, which is more than any of its competitors. Plus, the squared-off, wide tailgate is handy for loading unusually tall or stout objects. 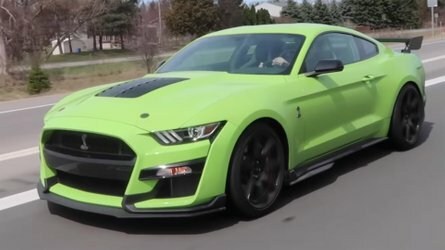 You can’t get that with a car-based, three-row crossover. Big presence. 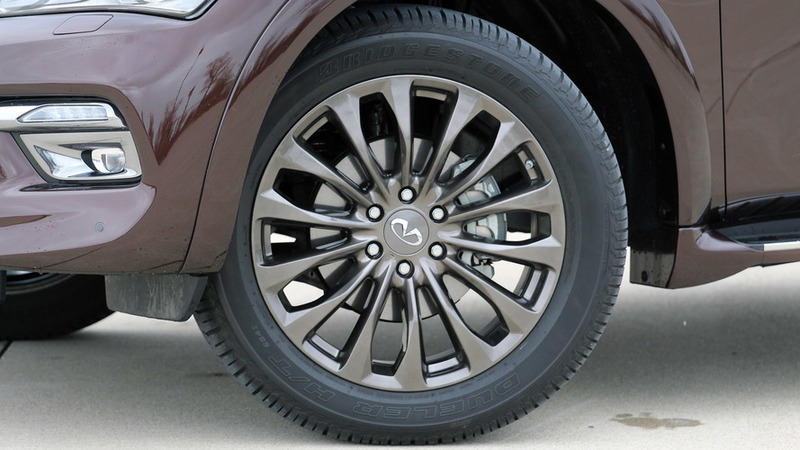 The first thing you notice about the QX80 is its size. It’s huge – longer than an Escalade or a Range Rover, super tall, and very imposing. But it makes a statement unlike many other big SUVs. 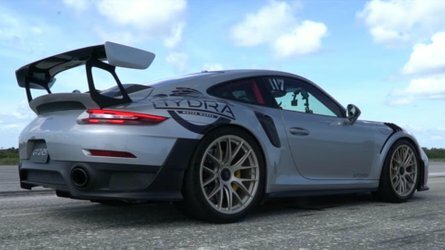 It has a powerful stance, with those stylish, 22-inch wheels. Okay, maybe it’s a little ugly, but I give Infiniti credit for bolstering that big, upright design with a whole lot of curb appeal. Looks luxurious, but isn’t. 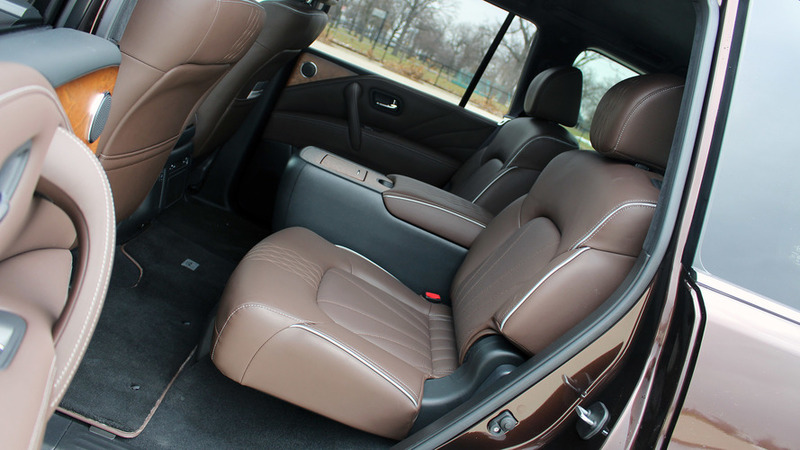 The interior is really nice to look at, with deep brown leather, nice wood trim, and elegant stitching on the seats. But the moment you touch something, the premium aura fades. 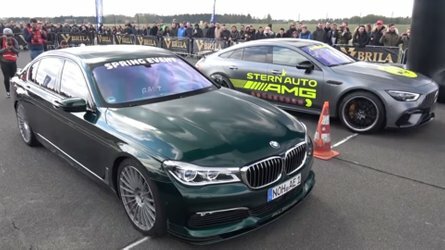 Not a single passenger in the front or rear seats was able to get comfortable, a lot of the Nissan-spec plastics feel out of place here, and the infotainment tech looks two generations too old. 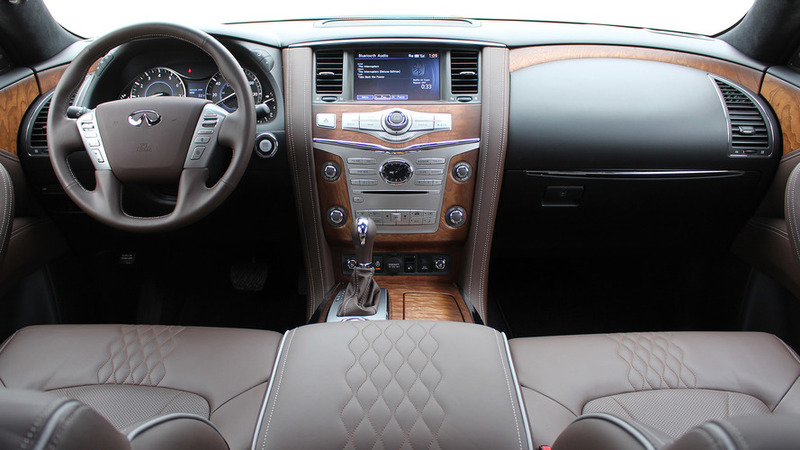 This interior is fine for a fully loaded, $60,000 Nissan Armada. But in a $90,000 Infiniti? Come on. 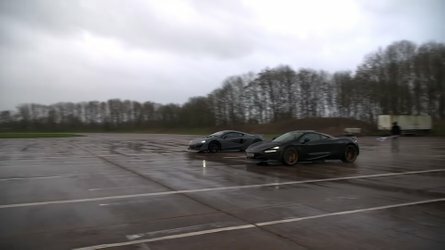 Lots of practical issues. The more time I spend in the QX80, the more I find little reasons to dislike it. The steering is super vague. It’s hard to get in and out of. The driver’s seating position is awkward – I sit way too high in this thing, but the steering wheel is too low. The powered third row seats take forever to fold down. It’s easily unsettled on broken pavement, despite that fancy hydraulic control system. After a week in the Infiniti, I find myself longing for the luxury of a Cadillac Escalade, cushiness of a Range Rover, or tech of a Mercedes GLS. Just buy an Armada. The QX80 is a softer, Americanized version of the Nissan Patrol sold overseas. So is the new 2017 Nissan Armada. 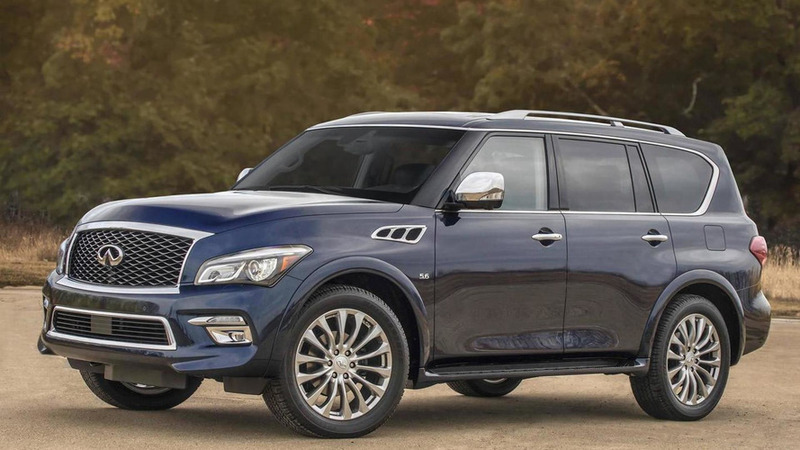 When I drove the Armada earlier this year, I summarized it by saying it’s “an Infiniti-level product at a Nissan price.” That’s great for Nissan, but bad for the QX80.